MACHINES!!! | Remarc Manufacturing Inc.
We are committed to always have the best equipment and the newest technology. We are also committed to American made machines. This commitment, along with a huge need for expansion helped us make some major moves for the end of the year! We are bringing in two brand new 2018 Haas machines and both will be here in December! The first machine is a Haas St 35Y turning center. It has large capacity, high speed, and live tooling which is going to set us apart when it comes to fast and intricate lathe/milling work. Now, a part that used to go from a lathe to a mill can be done in this one machine, all in one shot, at a fraction of the time. 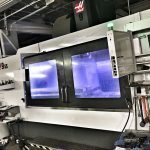 The second machine is a Haas GR 510 gantry mill. This Gantry/bridge style mill has a cutting envelope of 61″ x 121″ which is conveniently the same size as our waterjet. This really put us into a new milling category. Our VF9 has a 40″ x 84″ table (travel) so this gantry mill adds a significant amount of milling capacity. We are also getting it with the high speed spindle (15,000rpm) as well as several other performance enhancing options. It is an exciting time at Remarc Manufacturing!! !